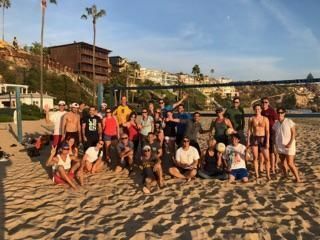 Deerfield Park INTERMEDIATE + SAND Volleyball- ! INTERMEDIATE (M), (H) & ADVANCED players only, should have good control of the ball on passes and sets with above-average agility, must understand the game. PLEASE READ THE POST AND ONLY SIGN UP IF YOU ARE OKAY WITH WHAT IS POSTED. The number of the players for each team will range 3 to 5 players, either on Tuesdays and Thursdays, depending on the number of participants. You should be comfortable either playing 3's or more. We have differences in playing levels and sizes. No one is responsible for your safety but you. You decide if you can play safely or not, or to play or not, at all. Please be attentive to your RSVPs and change them preferably a day in advance. If you have too many last minute cancellations or no-shows, or if any other player's plays/actions bother you, or you like to coach others without others asking, you may want to find another location to play. 3 last minute cancellation or a no show will get you off playing list for the following week/s. RSVP's are from the wait-list: Please note that most RSVP changes happen closer to the event day, either day before or on the day of the games. Regular players who show up on time and have similar playing abilities have priorities over occasional or other players. Each new player will make it to the playing list within the first 4 attempts. I may use my own discretion, time to time, to add a new player or remove a player from the RSVP list. Also, the new players without a history of the club need a recognizable picture to make it to the RSVP list. PS: I really hate making any kind of rules but when we have many people on the wait-list, we have to make sure everyone is attentive to their RSVP’s. Please understand the reasons why you may be removed: Attendance, Playing Level, Interactions With Others. Understanding what we need to pay attention to makes it fun & fair for everyone. Thank you for your participation and consideration of others.